Asus' EeeKeyboard is finally available for US customers to pre-order on Amazon, with a scheduled shipping date of late April. TechRadar has contacted Asus UK to find out more about the company's plans to release this intriguing-looking wireless keyboard PC in Britain, so stay tuned for updates on that front. 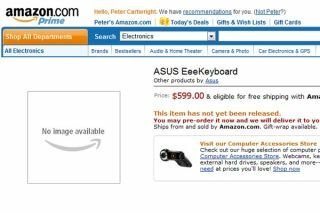 In the meantime, what we do know is that the Asus EeeKeyboard is listed on Amazon at $599 for the model with the following specs - 1.6GHz Atom N270 CPU, 1GB of DDR2 memory, Windows XP Home, 802.11b/g/n WiFi, a gigabit Ethernet jack, Bluetooth 2.1, a 16GB SSD, HDMI out, integrated Ultra-Wide-Broadband (UWB) receiver, three USB 2.0 sockets and a 5-inch LED-backlit, multitouch display with 800 x 480 resolution. While some critics have suggested that the spec is too low to justify that price point – particularly in light of Apple's recent release of the $499 iPad tablet PC – although it remains to be seen whether or not the 'use case' (essentially being able to convert your TV or any other screen into an instant PC) can justify that price. The inclusion of the UWB receiver for wireless playback of video and audio content on a monitor or TV is what many are suggesting might give the EeeKeyboard the edge over similarly priced netbooks and tablet PCs. That's certainly what the guys at Asus must be hoping. We will of course bring you all the latest news and a full review of the new Asus EeeKeyboard as soon as we (finally!) get our hands on one.